ZESCO United yesterday put up a spirited fight to force a 1-1 draw with Asec Mimosa in their 2016 CAF Champions League Group A match played at Stade Robert Champroux in Ivory Coast . After suffering a 3-1 defeat in the first leg at Ndola’s Levy Mwanawasa Stadium barely a fortnight ago, Asec were seeking a revenge on Zesco. But Jack Mwanza’s strike in the 79th minute gave Zesco the important away goal when he levelled matters and denied the Ivorian side the three points they badly needed. 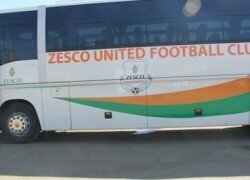 Zesco now maintain second position on seven points, three points better than Asec. Asec got off to a great start, testing Zesco’s Jacob Banda’s goalkeeping skills. The first chance fell to Asec in the eighth minute when the thunderous free-kick effort towards the top corner from the left angle was cleared away by Banda for a corner. The corner was cleared by Zesco defence, denying the home side the lead. Banda put up a good save in the 29th minute when Asec shot from close range. Zesco could have taken the lead four minutes after Jesse Were low shot from outside the box was superbly saved by Asec goalkeeper Herve Koffi. The home team continued to press for an opener but Zesco held firm to end the first-half on a stand-off. In second half, Asec looked set for an opener, creating problems for the Zesco defence led by Captain Ben Banh. The Ivorians hit twice in 10 minutes of play but were denied by the wood work and Banda. In the 57th minute, Zesco was given a scare when Adama Bakayoko free header from a cross by Konan Ngouan was posted wide of the net. Coach George Lwandamina substituted tired looking John Chang’andu for Mwape Mwelwa with the hope of getting a goal. However, Ibrahim Kone headed home in the 75th minute from a free kick. But Asec victory was short-lived when striker Jackson Mwanza struck in the 79th minute to level the scores for Zesco. Asec mounted pressure on Zesco 10 minutes before the final whistle by the visitors held firm. Substitute Idriss Mbombo and midfielder Clatous Chama missed clear chances in injury time denying Zesco the three points. Zesco has two games in hand against Moroccan side Wydad Casablanca and Egyptian giants Al Ahly. Casablanca was last night scheduled to play bottom placed Al Ahly.